"The Veiled Heroine 归隐的侠女 (guī yǐn dè xiá nǚ)"
The wife of Zhuge Liang 诸葛亮, Huang Yueying is a minor character in Romance of the Three Kingdoms. Apparently the name Huang Yueying may be a fictional one altogether since no historical records exists of Zhuge Liang's wife's real name. Some say she is even smarter than Zhuge Liang, but most would agree she is usually remembered for being ugly. So ugly, in fact, that she hid her face behind veils under the shadow of moonlight. In the card game, Huang Yueying is one of the most popular characters to use. She can be deadly when luck runs in her favour, and the odds usually side her since all she needs are tool cards. 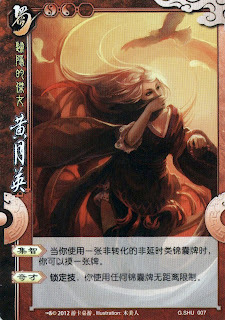 Character ability 1: "Assembling Wisdom 集智 (jí zhì)"
When you use a non-time-delay tool card that is not converted from other cards, you can draw a card. There is no distance restriction on tool cards used by you. “Assembling Wisdom” can only be activated if a non-converted, non-time-delay tool card is used. She cannot draw cards by activating Younger Zhuge Liang's abilities like “Arson 火计”, “Scient 看破” and “Shackle 连环”. To make this more clear, Huang Yueying can only draw 1 card with her ability if she uses the actual tool card. 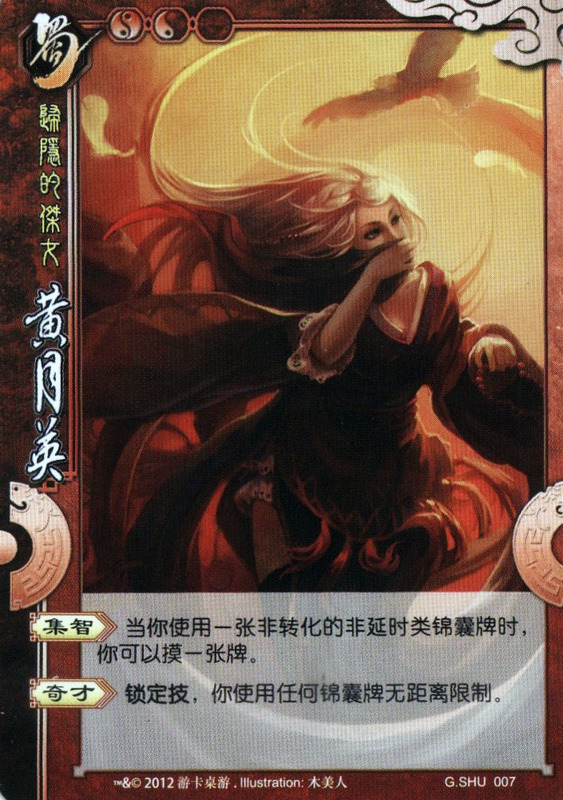 Eg: If she is partnered with Pang Tong and uses the card "IRON SHACKLES 铁锁链环", she can draw 1 card. But if she uses any other card with the suit of clubs as IRON SHACKLES (Pang Tong's ability), she cannot draw a card. “Genius” becomes enforced in SGS-KW. Both of her abilities are based on her superior intellect. Exactly how smart is she? *shrug* There does not seem to be any parallel of her character abilities in the story though. 集智 means collecting ideas. The game makers intend to show that Huang Yueying collect ideas for his husband to use in war, such as the mechanical carts to transport supplies to troops.